SCOTTSDALE, Ariz., Jan. 31, 2019 (GLOBE NEWSWIRE) -- The Alkaline Water Company Inc. (NASDAQ and TSXV: WTER), a leading producer of premium bottled alkaline drinking water sold under the brand name Alkaline88®, today announced that it has expanded an existing relationship with a key co-packaging partner based in Nevada. 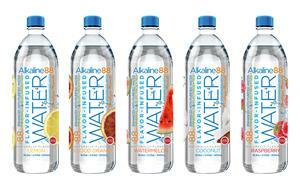 Specifically, Western Group Packaging (WGP) will begin producing the Company’s new flavored Alkaline88® water products. This news release contains "forward-looking statements." Statements in this news release that are not purely historical are forward-looking statements and include any statements regarding beliefs, plans, expectations or intentions regarding the future. Such forward-looking statements include, among other things, the following: We believe our all-natural extracts and sugar free offerings will be a big hit with consumers, we pioneered the enhance bulk water category with our Alkaline88® 1-gallon and 3-liter sizes and believe our new flavored waters will impact the enhanced water space in a similar fashion, this will be one of the many products we will bring to our current grocery and drugstore customers as well as convenience stores, we expect to begin selling our new flavored waters as soon as next week will be rolling out a number of other products over the next 45 days. The material assumptions supporting these forward-looking statements include, among others, that the demand for the Company's products will continue to significantly grow; that the past production capacity of the Company’s co-packing facilities can be maintained or increased; that the Company will receive all necessary regulatory approvals for the production and sale of CBD/hemp-infused water that there will be increased production capacity through implementation of new production facilities, new co-packers and new technology; that there will be an increase in number of products available for sale to retailers and consumers; that there will be an expansion in geographical areas by national retailers carrying the Company’s products; that there will be an expansion into new national and regional grocery retailers; that there will not be interruptions on production of the Company’s products; that there will not be a recall of products due to unintended contamination or other adverse events relating to the Company’s products; and that the Company will be able to obtain additional capital to meet the Company's growing demand and satisfy the capital expenditure requirements needed to increase production and support sales activity. Actual results could differ from those projected in any forward-looking statements due to numerous factors. Such factors include, among others, governmental regulations being implemented regarding the production and sale of alkaline water or any other products, including products containing CBD/hemp; the fact that consumers may not embrace and purchase any of the Company’s infused water products; the fact that the Company may not receive approval for any of its CBD infused products; the fact that even though the Farm Bill was passed into law, the Company may not receive approval from state and local regulatory bodies, the US Drug Association or the FDA for its CBD/hemp-infused products; additional competitors selling alkaline water and enhanced water products in bulk containers reducing the Company’s sales; the fact that the Company does not own or operate any of its production facilities and that co-packers may not renew current agreements and/or not satisfy increased production quotas; that fact that the Company has a limited number of suppliers of its unique bulk bottles; the potential for supply chain interruption due to factors beyond the Company’s control; the fact that there may be a recall of products due to unintended contamination; the inherent uncertainties associated with operating as an early stage company; changes in customer demand and the fact consumers may not embrace enhanced water products as expected or at all; the extent to which the Company is successful in gaining new long-term relationships with new retailers and retaining existing relationships with retailers; the Company’s ability to raise the additional funding that it will need to continue to pursue its business, planned capital expansion and sales activity; competition in the industry in which the Company operates and market conditions. These forward-looking statements are made as of the date of this news release, and the Company assumes no obligation to update the forward-looking statements, or to update the reasons why actual results could differ from those projected in the forward-looking statements, except as required by applicable law, including the securities laws of the United States and Canada. Although the Company believes that any beliefs, plans, expectations and intentions contained in this news release are reasonable, there can be no assurance that any such beliefs, plans, expectations or intentions will prove to be accurate. Readers should consult all of the information set forth herein and should also refer to the risk factors disclosure outlined in the reports and other documents the Company files with the SEC, available at www.sec.gov, and on the SEDAR, available at www.sedar.com.